This is a good offense to use if your team lacks post players, but instead has a number of good quick guards. See the basic set below. 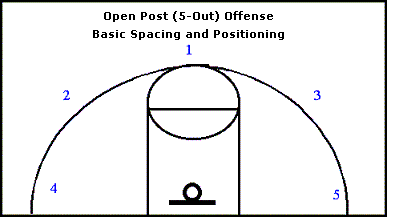 Also, see the Open Post Double-Up Offense and the 5-Out Zone Offense. The players are numbered only to show movement from one spot to the next. This offense is not designed for restrictive positioning. All 5 players must be able to move, pass and catch. For instance, O5 does not have to be a 3 point threat (although it helps), but he/she must be able to catch the ball on the perimeter and pass it to the open man. 1. If you have an overplay (being denied), back-cut. 2. If you have an underplay (defender sagging off), pop out to spread the defense. 3. Someone dribbling toward you, back-cut thru and then fill the vacant perimeter spot. 4. Fill the open spot when a teammate cuts or drives. 5. Dribble penetrate, relocate and fill open spot. The most important rule is to keep moving. If you do not catch a pass with 2 seconds you need to move on. When filling spots on the floor move up and away. It is very important that both the player setting the screen and the player coming off the screen read the defense. 1. Turn your rear end to the direction that you want the man you are screening for to go. 2. Set your feet solid and protect yourself by extending your arms down and crossing them. 3. Call out the name of the man you are screening for. 4. Screen the defense not the offense. Set your screen 2-3 feet away from your teammate, let him come to the screen. 1. Set the screen up by v-cutting or jab-stepping away from the screen and then running back into it. 2. Rub shoulders with the teammate who is setting the screen, take the defender to the screen. 3. Read the defense when you come off the screen. If the defense goes under a screen then the player coming off the screen should run off the top. If the defense follows you around the screen then the player coming off the screen should curl. (O1 in this case must replace himself at the point or O5 should fill all the way up to the point). If the defense switches on the screen, then the man who set the screen should seal the player he/she screened and come to the ball. If the defense overplays the screen then use a flare move. Ball side corner flashes to the post when the ball is passed to the wing. He must wait for the cutter to clear the post area. Rule for getting out of the post is to back screen the wing once the ball leaves. The wing curls around to the corner if he/she does not get the ball. Backside corner or wing flashes to the post. (You might want to specify which one has the freedom to flash in there to eliminate confusion). Again he must wait for the cutter to clear. Rule again is he/she must back screen the way out of the post. This time the wing (O2) clears to the opposite corner. Following the rule of "fill the open spot". Point passes to wing and screens away for weak side wing or corner. Weak side wing or corner flashes to the post. The point fills the corner no matter whom he/she screens for and the other players fill up. Again the rule is he/she must back screen the way out of the post on ball reversal. O2 continues to the corner. Again he/she must back screen on the way out of the post on ball reversal.